Opened 19 November 1934 with Lewis Gerard at the organ, followed by E Nelson Elms, Clifford Birchall, Charles Massey, Cecil Staton and Austin Rayner. 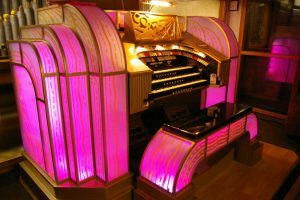 The organ was overhauled by SJ Wright & Son in 1956 and Austin Rayner returned using it as his base theatre for ABC. Both Lewis Gerard and Nelson Elms broadcast regularly. It was removed in 1968 and placed in storage until it was installed at Markfield during 1971/72. It retains both its Solo Cello and illuminated ABC style surround. Tibia, Diapason, Violin, Violin Celeste, Cello Vox Humana, Flute, Tuba, Muted Trumpet, Clarinet + Solo Cello.